If you have adjacent properties, it's nice to offer the option to rent the combination together. You can put the combination property as an additional listing and hit higher occupancy numbers on listing sites to attract larger groups where there is typically less competition. In OwnerRez, you'd create an additional property for the combination, which allows you to set different rules and rates for that property. A property where you rent the entire property, each room separately, and also by the bed inside a room. In OwnerRez, you'd create a property for each bed, each room, and one for the entire property. When a bed is booked, the bedroom and whole house properties would be blocked. If a room is booked, the whole house and each bed inside the room would be blocked. And if the whole house is booked, everything inside it would be blocked. To set up any of these scenarios, use the Mutual Blocking feature in the Calendar section of each property inside OwnerRez. For any property, you can pick what other properties will block it off when they are blocked or booked. That will set up a two way connection between the properties. Whenever a booking or block is created or changed or deleted at one, it'll update the others at near realtime -- within a minute or two. For the adjacent properties and the compound that represents both, go to property AB in the diagram above -- the main house property. Go to the Calendar tab of the property under the Mutual Blocking tab. Edit the linked properties and link to A and B. That's all you need to do as the reverse links are set up automatically. By Bed, Bedroom, and Entire House is a bit more complex. Go to property AB -- the entire house property. Go to the Calendar tab of the property under the Mutual Blocking tab. Edit the linked properties and link to every other property in the house -- A, B, A1, A2. The reverse links for those are set up automatically. Then the bedroom needs to be configured for the individual rooms as well. Go to the calendar mutual blocking area for property A -- the bedroom that has beds in it. 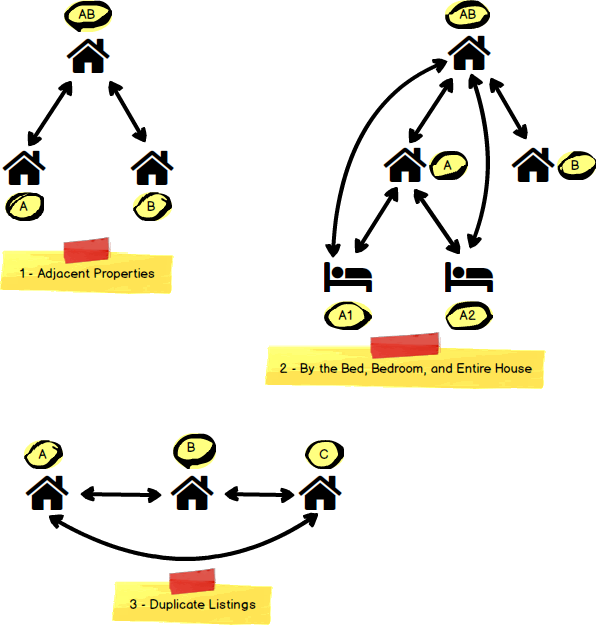 Edit the linked properties and add links to the bedrooms -- A1, A2. Duplicate Listings. Go to property A - the first duplicate property. Go to the Calendar tab of the property under the Mutual Blocking tab. Add links for B and C. The reverse links for those are set up automatically. Then property B needs to be linked to C as well. Go to the calendar mutual blocking area for property B. Edit the linked properties and add links to C as well as A. What if you want to block one property but don't want the linked properties blocked? When adding the block, check the "Don't block off other properties" box. If you've already created the block, go to the Info tab and hit the Change button. The same "Don't block other properties" option can be edited for existing blocks there.